When Randy and I were first married I worked at a flower shop in Salt Lake, Artichokes and Co. (now Olive and Cocoa). I also had the opportunity after that to work with Brenda of Pocket Full of Posies on some weddings. These jobs were pure fun! I look back on that time in my life with a smile. Working with flowers is just plain dreamy. 1. 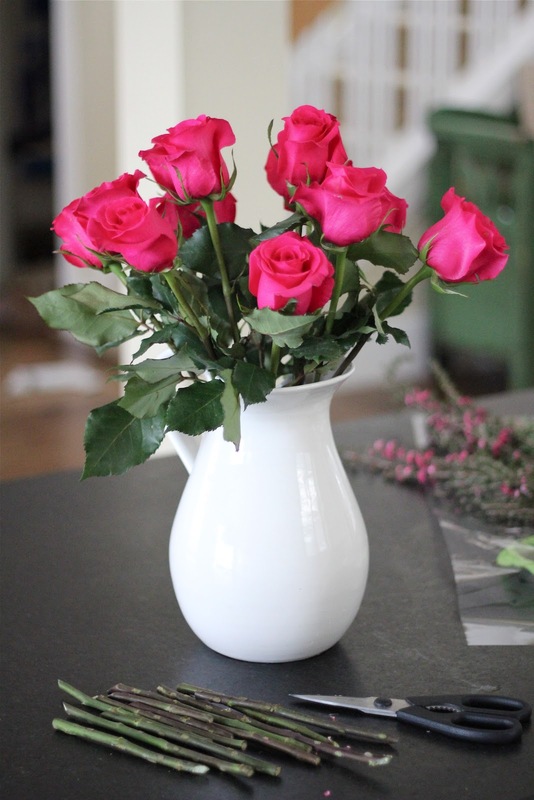 Go shopping in your kitchen for a vessel to arrange your flowers in (make sure the opening on your vessel isn't too wide or you'll have a hard time arranging the roses). I chose a pitcher! Fill your vase (in my case, pitcher) 2/3 with luke warm water. Dissolve the "food" packet into the water that came with your flowers. This will increase the life of your roses. Unwrap your flowers and strip away any leaves that will be submerged or touch the water. This is especially important if you are using a clear glass container. The florist has most likely already done this for you, but you may need to do a little stripping yourself. 2. 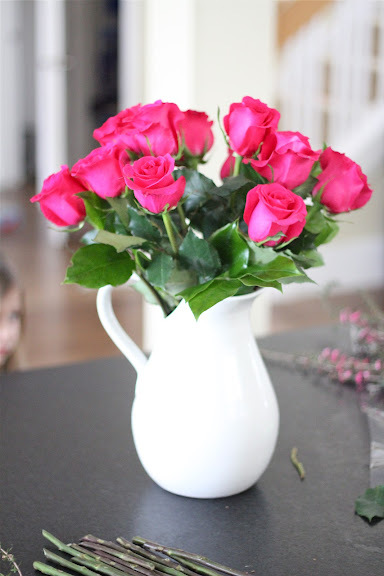 Scoot your vase to the edge of your work surface. Hold a rose up to the vase with the stem hanging down (I taped the rose to the pitcher here because I couldn't get the right shot by holding it). Raise and lower the flower to determine the height you want your arrangement to be. I drew on the picture to help illustrate this better. I usually leave about a third of the flower above the rim. 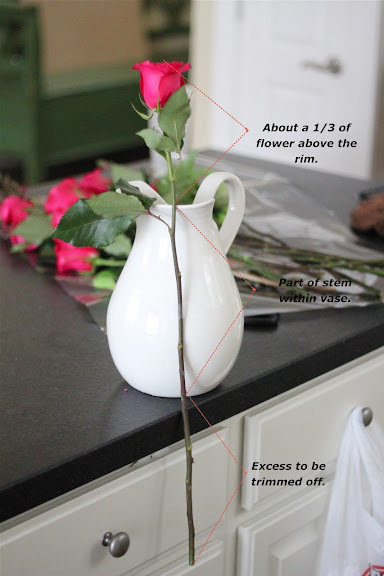 Once you have determined the height you want, cut (the sharper the scissors the better) the excess stem off at the base of your vase at an angle. It's very important that you cut the stem at an angle to create more surface area for water to be drawn in. 3. Proceed to cut all roses the same height (ish) as the first. 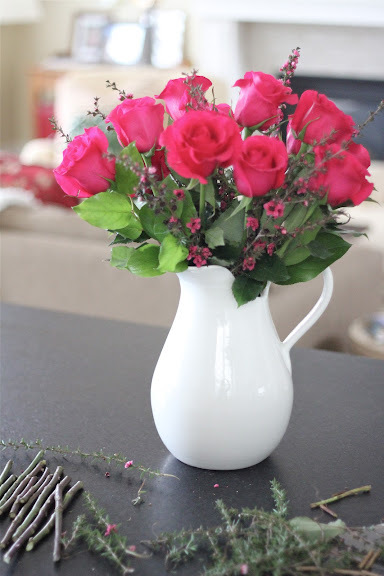 As you cut, place each flower in your vase at an angle, criss-crossing the stems. This creates stability to build the roses up how you want them. As you go make sure to turn your vase to view all angles of your arrangement. If you feel a stem is too long, simply trim a little off and reposition or swap it out. This is normal and you will need to do this to get the right shape. 4. On your last few roses position them down in the center of your arrangement. The criss-crossed stems will keep them stable and upright. 5. When you are satisfied with the shape of your arrangement, take the greenery and fill it around the base of the roses (refer to above picture). Trim it as needed to get the right height. Strip the greenery of any leaves that will be submerged in the water. The greenery is fun to do because it hides errors and gives your arrangement polish. 6. Take any other filler that was included with your bouquet and position it in and around the roses. Trim it accordingly and making sure to strip it of any leaves or things that will be touching or submerged in the water. If you don't, it'll make things scummy, therefore the water won't be as fresh, therefore your roses won't last as long. Sorry if you heard me the first time I said that. 7. 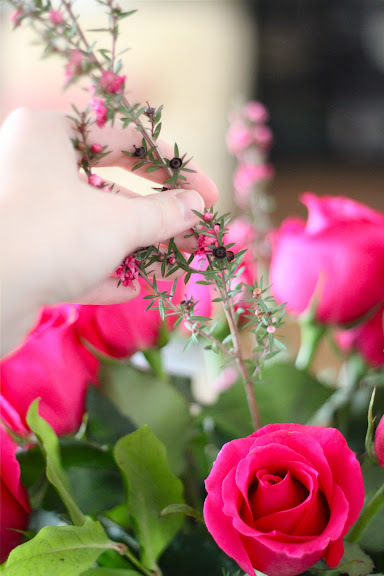 Lastly, trim away any leaves or greenery that looks limp and pull any rose petals that are flopping or torn. And voila! Thanks for the tip! Looks beautiful! How fun to work at a flower shop!!! Thanks, Kjirst! You are the sweetest. Bri, this is the perfect kind of thing to post about - I definitely needed the toot. Gracias.